Last but not least, the final winner of our inaugural Best In Show prize for the 8th annual Exposed DC Photography Show. We invited a panel of six distinguished Washington-area photojournalists to pick, in their esteemed opinion, their favorite photograph from our group of 49 images. Each Best In Show winner receives a $100 prize made possible by the Corcoran College of Art + Design. Tickets for the show, which opens next Wednesday, March 19, are available now. Exposed: Can you describe the scene, and where you were when you took this photo? Gallardo: I took this photo at the Sweetlife Festival in 2013. I was sent to the Meriweather Pavillion, where it usually takes place, by The Huffington Post to try to capture all the fun moments, craziness and unexpected insanity that comes with this kind of summer festival. Exposed: The couple is clearly not worried about the crowd around them, did they have any idea you took the picture? Did they have any reaction? Gallardo: Well, I had just gotten there when out of nowhere the sky turned gray and it started pouring rain. As I ran for cover, I saw this couple passionately kissing on the floor without really caring about anybody, so I took one shot and kept running for cover. To this day I don’t know who they are so I started a website Finding John and Jane Doe to see if we can reach out to the internet and see if anybody recognizes them. I’m hoping to find them and get them a print. Exposed: How did you decide to enter this photo in the contest? What made you select this shot? Gallardo: I entered last year and got in with a photo of a protest in downtown D.C. I gave it a shot this year and got in again, which was pleasantly surprising. This shot embodies what everybody’s teenage years looked like, and how much disregard there is for everything we do when ‘love is in the air’. You can see more of Gallardo’s work on his website. His winning photo is also the cover of our exhibition program. Only two more to go! Here is the fifth of six winners of our inaugural Best In Show prizes for the 8th annual Exposed DC Photography Show. We invited a panel of distinguished Washington-area photojournalists to pick, in their esteemed opinion, their favorite photograph from our group of 49 images. Each Best In Show winner receives a $100 prize made possible by the Corcoran College of Art + Design. We’ll be announcing the winners each day through next Monday. Tickets for the show, which opens next Wednesday, March 19, are available now. 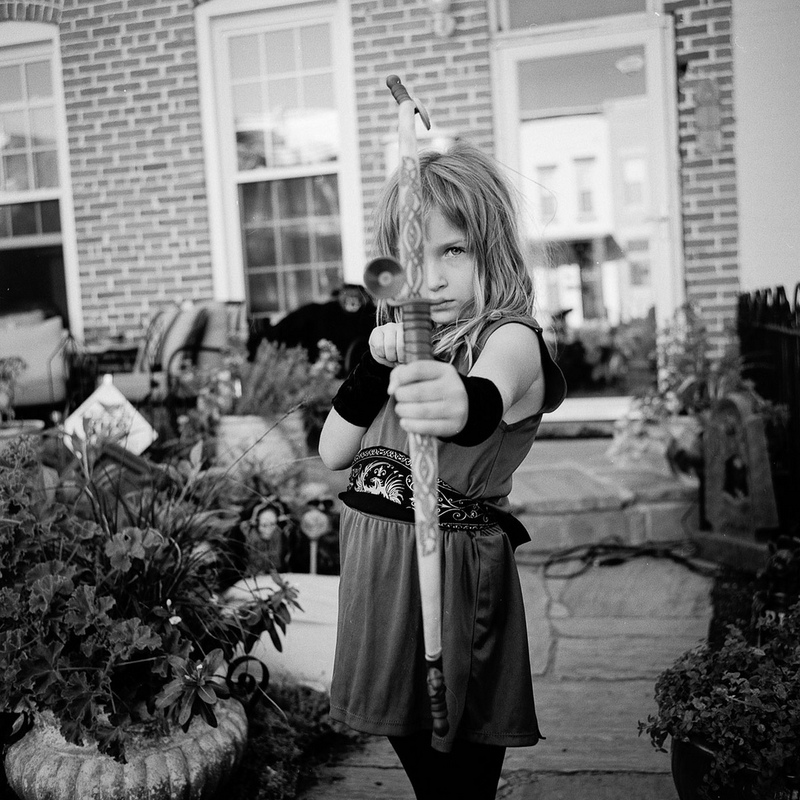 Today’s Best in Show image is “Girl With Bow and Arrow” by Patrick Wright. Congrats Patrick! His photo was chosen by judge Jacquelyn Martin, a staff photojournalist with the Associated Press, Washington D.C. bureau and the president of Women Photojournalists of Washington. Exposed: Where were you when you took this photo? Was it staged, or a scene you came upon? Wright: As part of an ongoing photo project, I walk around my neighborhood in Capitol Hill looking for strangers to photograph. I saw this girl in costume and thought she’d make for a great subject. As I was walking towards her, her mother pointed to my twin-lens reflex camera and said, “Hey, that’s an antique!” I took the opportunity to introduce myself and after a few minutes of conversation, asked if I could take a photo of her daughter. She agreed and her daughter did, too. But as I was preparing to photograph her, she looked timidly at her feet. So I said, “You can aim your arrow at me. Just promise me that you won’t shoot!” Her expression transformed. It was like watching an actress disappear into a role. Exposed: The young archer has a very intense look on her face. Has the girl and her family seen the photo? Did you share it with them? Wright: Yes, I did share it with them. I left a print at their front door but I don’t know what they thought of it. I guess her intense look will forever be one of my life’s mysteries. Exposed: How did you decide which images to enter into the contest? What made you choose this photo? Wright: I submitted three photos: my favorite, my wife’s favorite, and my most favorited photo on Flickr. This one was my wife’s favorite. See more of Patrick’s work at his website. And now for the fourth of six winners of our inaugural Best In Show prizes for the 8th annual Exposed DC Photography Show. We invited a panel of distinguished Washington-area photojournalists to pick, in their esteemed opinion, their favorite photograph from our group of 49 images. Each Best In Show winner receives a $100 prize made possible by the Corcoran College of Art + Design. Today’s Best in Show image is “Do or Dye” by Rey Lopez. Congrats Rey! His photo was chosen by judge Nancy Walz, the Director of Photo Services at Discovery Creative. Exposed: For those that may not know, can you explain what was happening in this photo? Lopez: At the finish line of the DC 5K Color Run, the promoters put on a party with a live concert, dancing and color throws for the participants. People were running around, excited from the endorphins of finishing a race and ready to have a good time. This photo captures just a piece of the finish line festivities. Exposed: How did your camera hold up covering the Color Run? Did you destroy any equipment that day? Lopez: I got lucky that day! I hadn’t experienced a color run before, so I didn’t realize that by the end of the day, I’d be just as paint-coated as the runners I was photographing. But, the weather called for rain that day and I prepared by encasing my camera and lens bodies in plastic. It didn’t end up raining, but the plastic saved my equipment from any potential damage or discoloration. 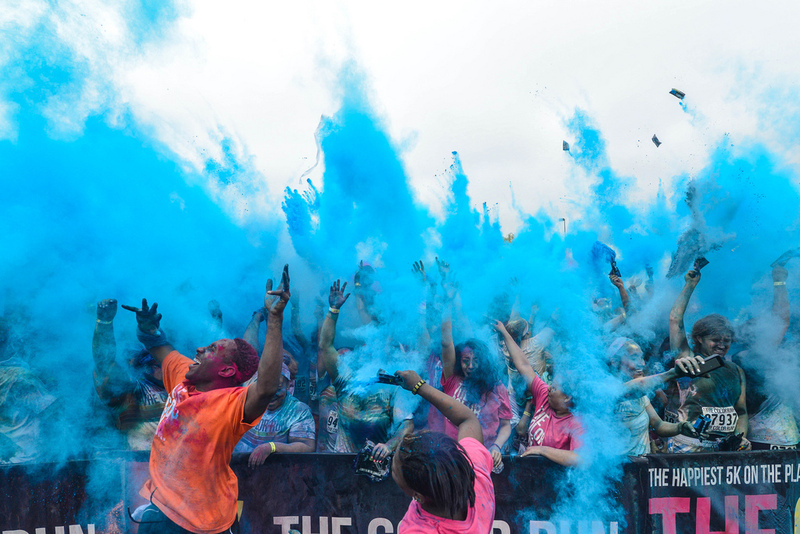 Exposed: Did you follow any of the controversy over the image used by the Color Run in an ad without permission from a photographer? Has anyone from the Color Run approached you about the photo? Lopez: I did follow the controversy. Given what I do, I am always interested in the legal disputes that seem to come up so often in the photography world (the right to shoot in a particular venue, the rights of a photographer in his/her own work, etc.) No, I have not been approached about this photo, but worked with the Color Run in capturing it. You can see more of Lopez’s work on his website. And now for the third of six winners of our inaugural Best In Show prizes for the 8th annual Exposed DC Photography Show. We invited a panel of distinguished Washington-area photojournalists to pick, in their esteemed opinion, their favorite photograph from our group of 49 images. Each Best In Show winner receives a $100 prize made possible by the Corcoran College of Art + Design. Today’s Best in Show image is “Chinatown King” by Veeresh Inginshetty. Congrats Veeresh! His photo was chosen by judge Lucian Perkins, a staff photojournalist with the Washington Post and two-time Pulitzer Prize winner. Exposed: There is so much activity in your image, and so many engaging expressions. Can you share with us where this was, and what was happening? 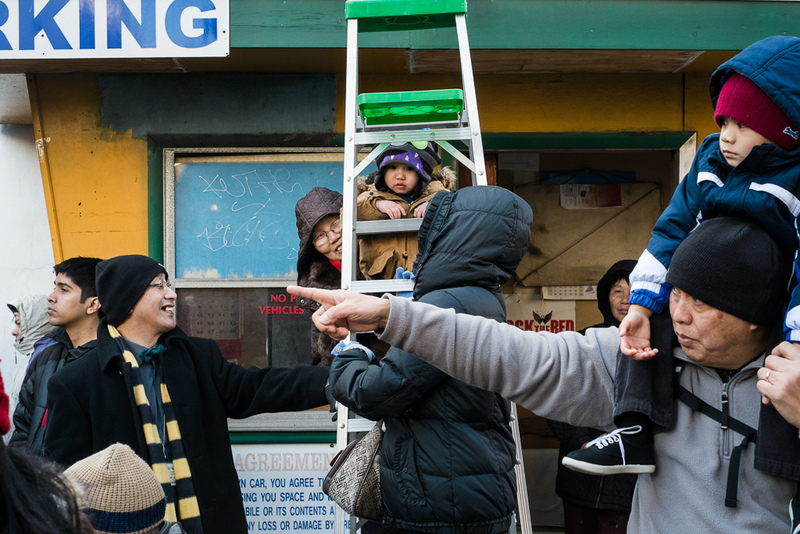 Inginshetty: This was photographed at a parking lot on H St (close to the Gallery Place / Chinatown Metro station) during the 2013 Chinese New Year celebrations. I was close to the stage waiting for fireworks to begin when I saw this family having a good time. I liked the way the ladder framed and emphasized the kid’s face, but the frame in totality seemed incomplete. I decided to wait for some time to see if I could get another element of interest in the picture and after couple of minutes, I saw a gentleman with a kid on his shoulders trying to get to the other side. I found the missing piece and was fortunate that everything came together to make for a very interesting composition. The “King” part however was a very lucky co-incidence, I had missed that part of the frame while composing as everything was happening so fast as it is with most street photographs. Exposed: What made you choose this image to enter into the show? Inginshetty: I have been entering images for the past 2-3 years and this is the first one that made it through. The layers in the photograph along with the expressions is what I like about the photograph and for these reasons I thought this would be the right entry for Exposed DC. Exposed: Your Best In Show prize was awarded by Lucian Perkins, a photojournalist with the Washington Post. Are you familiar with his work? Inginshetty: Honestly, I wasn’t aware of Mr. Perkins’ work before this. I did look up his work and I must admit I am surprised that I didn’t come across his name earlier. It’s a big confidence booster to have had my photograph chosen by a two-time Pulitzer prize winner and I have to thank Exposed DC for it. We’re happy to announce the second of six winners of our inaugural Best In Show prizes for the 8th annual Exposed DC Photography Show. We invited a panel of distinguished Washington-area photojournalists to, in their esteemed opinion, pick their favorite photograph from our group of 49 images. Each Best In Show winner receives a $100 prize made possible by the Corcoran College of Art + Design. Today’s Best in Show image is the moody “Carnival Giraffe” by Erika Nizborski. Congrats Erika! Her photo was chosen by judge Dan Westergren, Director of Photography for National Geographic Traveler. Exposed: Can you give us some background on this photo, where was it taken, why was there a giant giraffe on a trailer, and what were you doing there? Nizborski: My photo titled Carnival Giraffe is part of a larger photo series called The Hyattsville Project which I have been working on for about one year now. It’s a personal project that I have assigned myself in which I document my neighborhood. Carnival Giraffe was shot in Magruder Park on Hyattsville Day 2013. One day each spring the city comes together for a parade that starts on one side of town and ends at Magruder Park where a carnival then takes place. 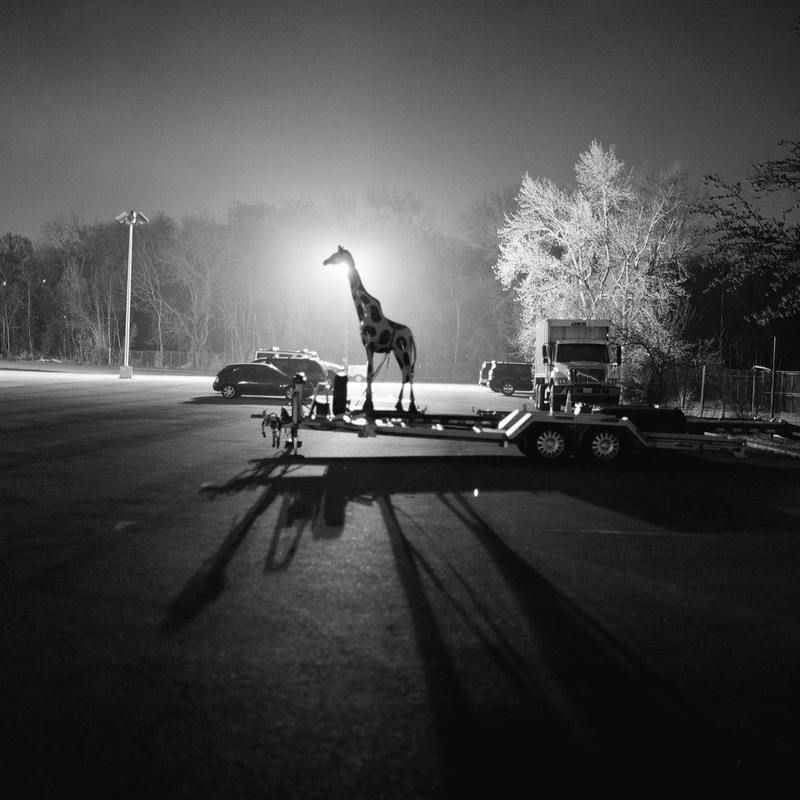 I was leaving the carnival and I spotted the giraffe in the parking lot with the street light behind it. I thought it was really strange, why didn’t the giraffe statue make it into the carnival? I was also drawn to the amazing light coming from behind it. I had my tripod with me, because I was taking other nighttime long exposures, so I set it up and took a few frames. I have also made it a rule to shoot this entire project on black and white film. I have found that with my professional work (which I only shoot with a digital camera) I sometimes end up taking far more images than I would ever need for one event. By shooting film for this project I am teaching myself to slow down. Film isn’t cheap and I only get 12 frames per roll, so I am very conservative with it. Exposed: Your Flickr photos are funny and odd street scenes like this photo, but your professional work is weddings and portraits. How do you merge these two styles? Nizborski: I haven’t ever thought of merging my professional work with my personal work before. They are very different. I am a wedding, event, and portrait photographer by day, and I like to think of my personal projects as assignments to strengthen my eye and craft. In my line of work capturing moments is a must, so I am constantly looking out for them. Exposed: Dan Westergren awarded your prize. Do you read National Geographic Traveler and are you familiar with his work? Nizborski: When I saw that I was one of the photographers that won the Best in Show I was honored and thrilled! I saw that Dan Westergren had voted for my photo. I read National Geographic Traveler from time to time, and while I did not immediately recognize his name, as soon as I pulled his website up I recognized his work. While his style and subjects are far different than mine, I see that his work relies heavily on moments as well. The whole experience of being a part of Exposed DC has really inspired me so far. You can view more of Erika’s work on her website.